I’ve talked before about how crazy our work schedules are right now. So I’ve been trying to make the weekend evenings extra special so we can reconnect and enjoy each other’s company and not get caught up in the stress of being apart so often. 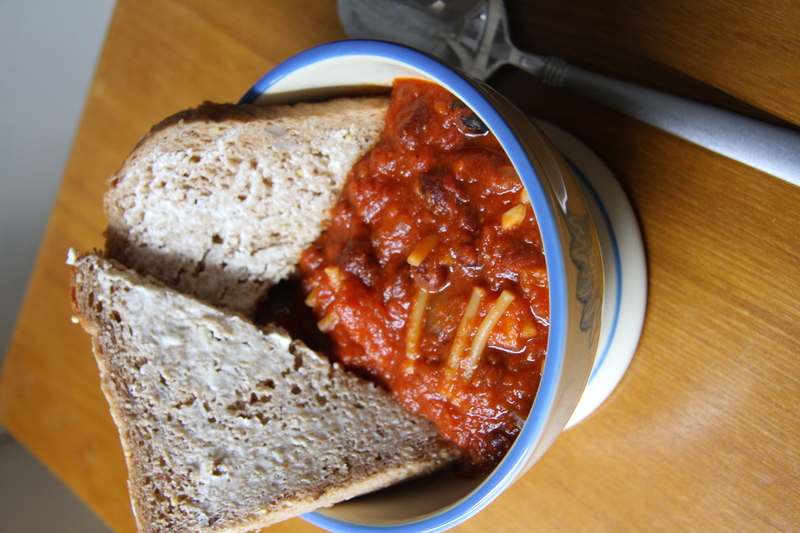 I have also resolved to try a new recipe each week. These goals collided in a very wonderful way friday night. 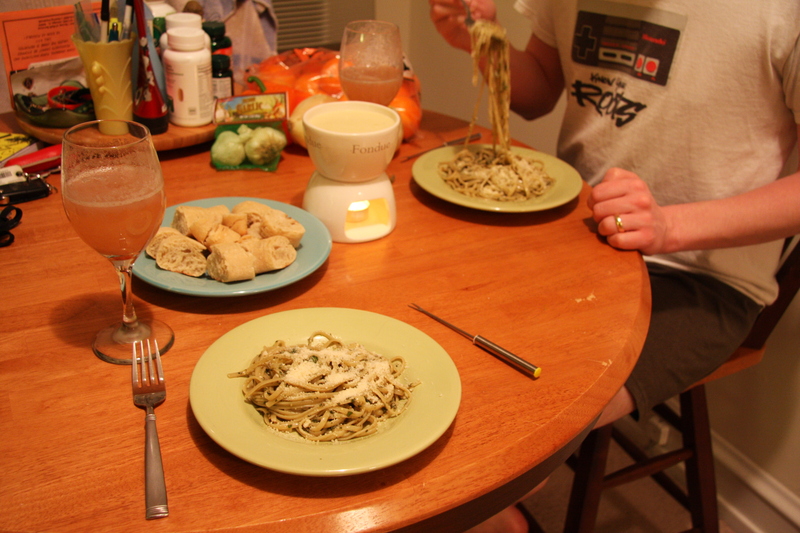 I made Fondue, Basil-Walnut Pesto over Pasta, and Strawberry Bellinis. We ate slowly while talking and listening to Florence and the Machine. The only word I can use to describe the evening is “lovely”. 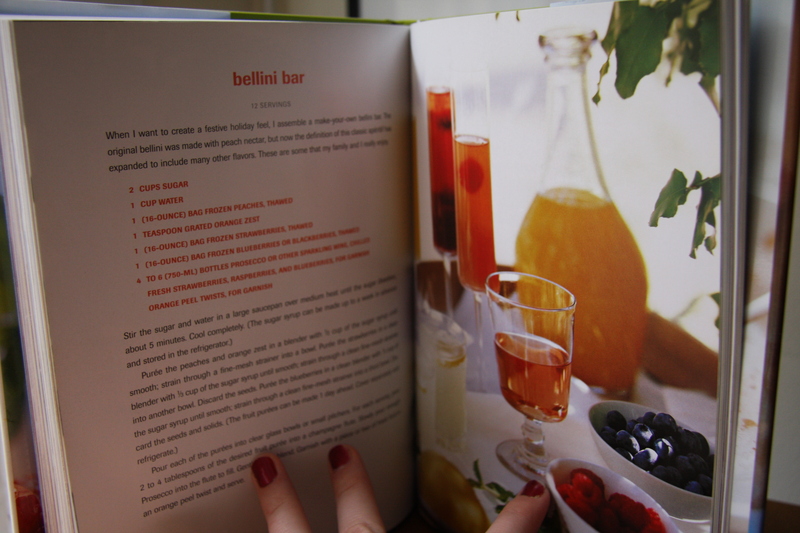 My new recipe was Bellinis from Giada’s Family Dinners Cookbook. They were SO good. The perfect way to unwind from a long week. 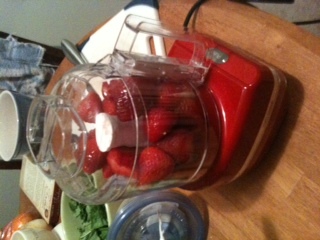 I used my new, fabulous food chopper to puree the strawberries to perfection. 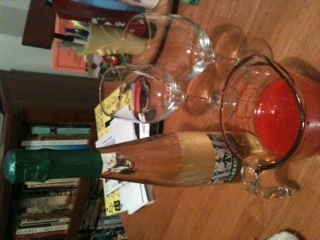 The organic sparkling wine was from Trader Joe’s for only $5. I LOVE Trader Joe’s! 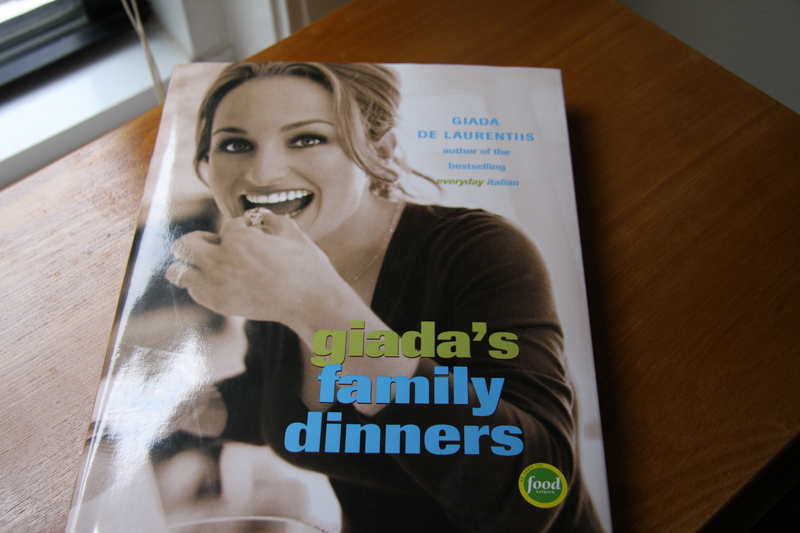 The meal was fantastic. We will certainly be having this again. Hi everyone. I hope you had a warm and loving Valentine’s day. I really dislike it when people say that Valentine’s day means nothing but a holiday for greeting cards. To me its a day to bring our focus to the present and allow us to take stock of whats most important. I spent a lot of the day thinking about how much I love my friends, family, and all the little animals in my life. It’s easy to forget that love does not require money or things. And if it does than maybe that’s not love at all. This year Trent and I agreed no gifts. We didn’t even do cards (which is rare because I’m kind of a card fanatic). We considered Saturday to be our V-day celebration since Trent works late during the week. 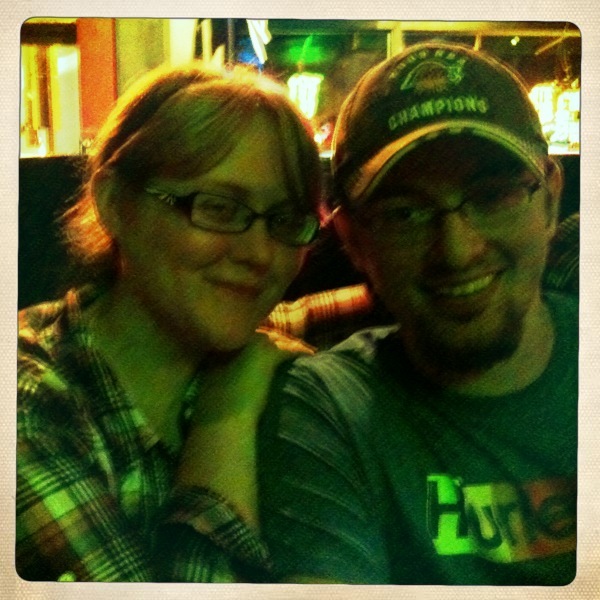 He met me at the train when I got off work and we walked to a restaurant in our neighborhood. It was low-key, burgers (mine veggie of course) and beer. It was fantastic. 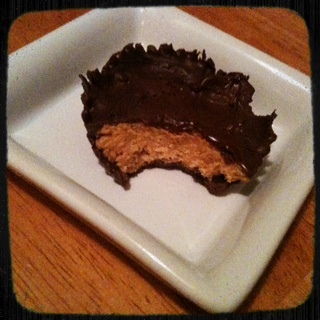 We gobbled it up before I even thought to take a photo. After dinner we really wanted to see Blue Valentine. I’ve been waiting to see that film for over a year. But it was sold out so we ended up going to a book store, walked around talking about all the books on our to-read list, and bought a gift for our nephew’s upcoming birthday. It was such a simple, quiet night just how we like it. Although we said no gifts and we officially celebrated love day on saturday, Trent surprised me with these beautiful flowers and my favorite wine. I got the sweetest surprise in the mail yesterday. There was a card with no return address in a bright pink envelope. 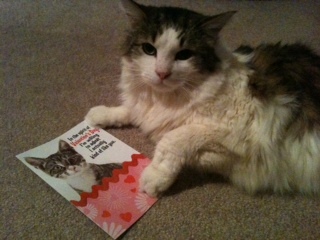 I opened it up and it was a funny, sweet card signed ‘Menard’ (our cat). Of course I can spot my mom’s handwriting from a mile away so I knew she had addressed and sent it but I was a little surprised because she doesn’t really get into cards. So after a little investigative work she confessed that it was actually picked out and purchased my step-dad. My family knows how much I adore my cat. I thought it was so thoughtful to pick out such a card but I wasnt too surprised because my step-dad Ted happens to be one of the most thoughtful, wonderful men you could ever have the pleasure of meeting. Officially he is my step father but in my heart he is my dad. Because I am me, I had to have Menard pose with the card for a quick photo. Poor cat! In the spirit of the day, let me get mushy here and say thank you to all of my readers. I am always surprised when people comment or I read the stats and see that more and more people are reading. Thank you! In other news, we survived the Chicago Blizzard of 2011. And yes that deserves capital letters. We are now experiencing a warm up and melt down. Its beautiful and soggy. I am getting closer and closer to returning to the beach and I could not be happier. I took this photo last Wednesday. 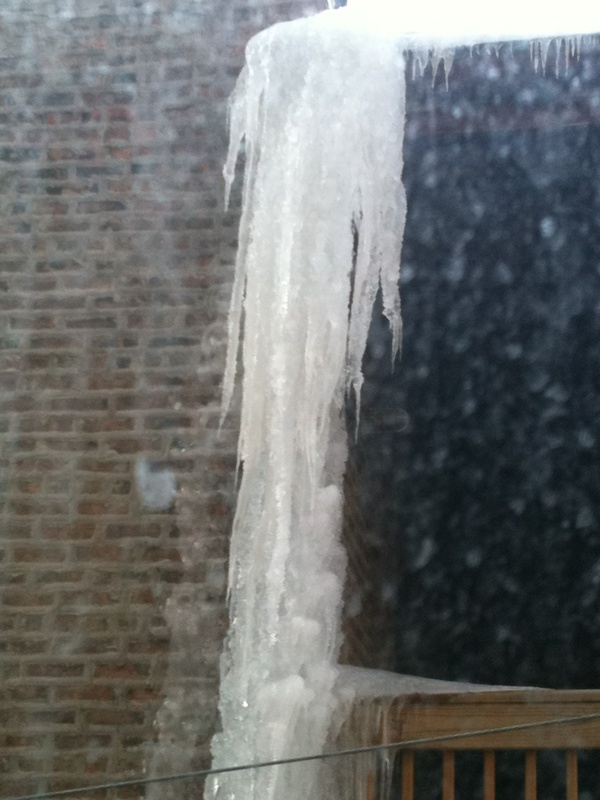 It’s the building across the alley from us and I was shocked at the size of this icicle. Remarkably this monster is now gone. 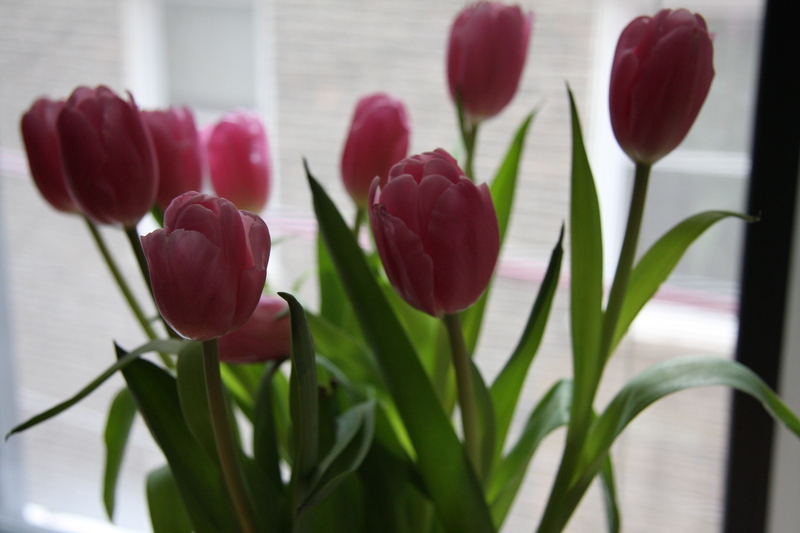 A sure sign that we are warming up for spring. Did you watch the Grammy’s? I am still elated that Arcade Fire won. Their album “The Suburbs” has been in heavy rotation on my iPod and I am so happy that their brilliance was rewarded and recognized. Happy Valentine’s day baby. I love you.